The families of the asylum seekers who died say the Government didn’t do enough – but Australian politicians say the move is ‘shameful’. FAMILIES OF ASYLUM-SEEKERS killed in a shipwreck off Australia’s Christmas Island in 2010 are suing the government, arguing it breached its duty of care in a move Canberra has blasted as “shameful”. Fifty people died when a rickety fishing boat crowded with nearly 100 Iraqi, Kurdish and Iranian asylum-seekers was dashed against jagged rocks in dangerous seas at the remote Indian Ocean outpost. Human rights lawyer George Newhouse has launched legal action in the New South Wales state Supreme Court on behalf of eight families, claiming the government failed to maintain a proper lookout. “We believe that the evidence will show that the Commonwealth knew, or should have known, that there were vulnerable men, women and children that were on the high seas in a storm and took insufficient steps to look out for them,” he said in a statement. He also claimed that when authorities found out the boat was foundering, the systems in place and operational life-saving vessels to rescue them were not adequate. At the time authorities said they were not aware the boat was approaching Christmas Island due to the predawn darkness and “extreme” weather conditions. Woken by the screams of victims, locals gathered life jackets and rushed to the sheer limestone cliffs to offer help, but strong winds blew the flotation devices back onshore. The terrified group on board drifted for about an hour after losing engine power and only one man managed to leap to safety before the surging waves smashed the vessel apart on the rocks. Fifty people died and 42 were rescued by the Navy and customs and border protection officials. Australia’s Immigration Minister Scott Morrison defended the actions of the government at the time, which was a Labour administration. The conservatives are now in power. “Frankly, I think this is a shameful and offensive claim to be making,” he told reporters. Sure, people have the right to bring cases to court — we are a free country — but they have to be accountable for the claims. The Refugee Action Coalition claimed Morrison did not know what he was talking about. “It seems that the minister is not actually familiar with the legal case. The families are not suing the Navy or their rescuers on the day,” said spokesman Ian Rintoul. What the legal case is highlighting is the negligence of the Commonwealth and the complete lack of preparation or adequate rescue facilities or equipment on Christmas Island that could have avoided the tragedy. If the minister was really concerned with safety of life at sea he would welcome the court case. After an eight-month hearing coroner Alastair Hope laid the blame for the tragedy firmly on the people-smugglers who organised the trip. But he also criticised Australian authorities for the lack of adequate rescue vessels on the island. Hundreds of people have died making the perilous sea journey to Australia, although no boat has arrived in nearly six months under the government’s harsh new policies. Boats are now turned back at sea, mostly to Indonesia, while anyone arriving is sent to camps in Nauru or Papua New Guinea for processing and permanent resettlement. Email “Families of people who died in shipwreck at Christmas Island to sue Australia”. 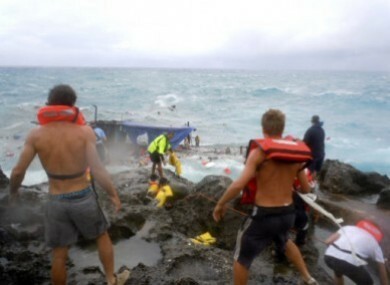 Feedback on “Families of people who died in shipwreck at Christmas Island to sue Australia”.